I was a young lady who wanted the better for both of my daughters. I moved to the U.S. followed by a shadow to whom I believed was God helping me cross safely to California. I lived with my mom in Apatzingan, Michoacan in Mexico. I was born in a small town of Uruapan, in 1976. Time passed by and I was the second to oldest. At that time I only had three younger siblings and one older sister. We were very poor and my parents could barely afford to give us food and clothes. They were capable of maintaining their house. I had to be mature and realize that the state in which my parents were they were going to need my help. My sister worked and I stayed home to take care of my siblings, cleaned the house, and did other chores. I was very sad that I had to help out my parents this way but I knew I was going to get payed back better. My sister was very stingy with all the things she owned. I was very upset and I would always tell my mom. Jealousy played a big role in my sister’s feelings and her attitude. Ever since I saw that I would always take care of my siblings, I fell in love with teaching them. This is when becoming a teacher was born into my life. This started on my golden birthday. I had already planned out what my life was going to be when I got older. I told myself “Yo voy hacer una maestra y nadie lo va cambiar!” I will become a teacher and no one will ever change that. My mom thought it was a great idea. This has always been my goal, I know someday I will complete this goal of mine. This was my mindset ever since I was little. One day I met a guy who I have claimed to be in love with. He changed my whole life plan. I had two amazing daughters and they were only two years apart from each other. I was only 16 years young when I had the oldest. I knew from this day I was not going to be able to become a teacher. My mom did not like my boyfriend at all. She thought he was not the right man for me. She would tell me, “No estés con él porque yo sé que él no es el hombre para ti!” Don’t be with him because he is not the right man for you. I always disliked the fact that my boyfriend wasn’t good enough for my mom. Although, he was very responsible, respectful, and very hard-working. I had made a plan to go to the U.S. to give my daughters better than I had. This choice made me very sad because I knew that the journey was not going to be easy and I would leave my parents alone. 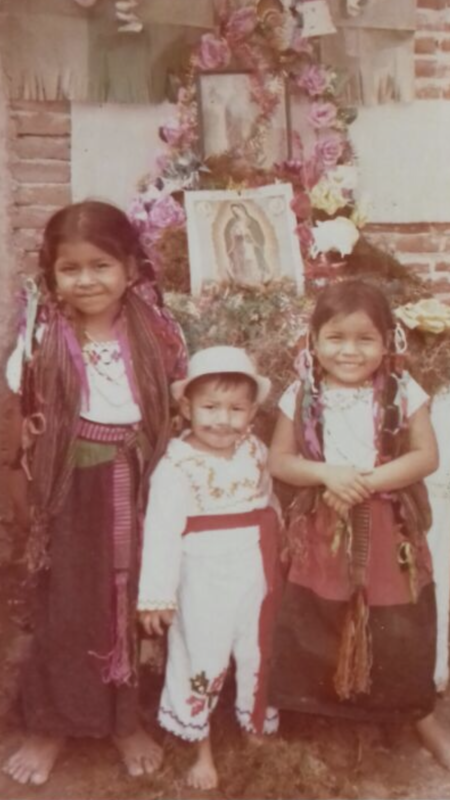 I knew back at home there weren’t many choices for my family and I. I wanted to leave Mexico because I wanted to live a better life than my mom could give me. My parents were poor and I wanted to give them a little more than they could get. I want my children to attend schools and go onto college to begin a career that will help them be more fortunate than I did. I had an idea of living in better conditions and being in a place where poverty was not going to be a problem. I could remember myself weeping at night just thinking about leaving the place I grew up in and starting a new life. Next, I had decided that I had no choice than to leave my daughters in Mexico. The feeling of leaving my daughters scarred my life. It was one of the hardest decisions. My plan was to go to the U.S., save some money and send it so that they can come safely and not the way I had to arrive. 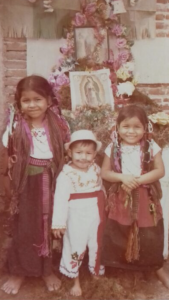 At the time, I was focusing on trying to get my daughters to the U.S. safely. And so my journey began. I had left in a bus to get to the border. After I started to walk through the desert. The sun was very hot like the souls of my feet were burning. I felt very dehydrated and all that I could remember was not stopping and continue my expedition. Throughout my way I had the fear of getting caught and being sent back to Mexico. After, I arrived in Los Angeles, California. Getting used to the new lifestyle and not being able to speak the language was very difficult. I wasn’t able to find a job easily because I didn’t know english and it was hard for me to look for a job alone. I was glad that I met someone who spoke both english and spanish. Her name was Veronica, she was my first friend here in the U.S. I was able to maintain myself for a couple of months until my husband got here. When he arrived he started to help me pay everything. I was happy that I wasn’t going to be alone in the process of starting a new life in America. At the time, rent was very cheap compared to what I would get paid. The paid load was not very much but compared to back then it wasn’t bad at all. I am very grateful to be in a place where I know would not be a waste of my time. I started to work in a factory, I would sew pants and make jeans. I would also design clothing. Back when I lived in Mexico, I would make clothes of my own and sell in the streets. I would save up money to give my daughters. I thought maybe I could make my own clothing line. Although this did not happen, I still have chances to accomplish some goals. I’m currently going to school to learn english. I am still trying to become a teacher one day. I have five amazing kids, one is currently in High School. I’m preparing myself for anything that comes her way. I hope that one day they will go to college and have a career. I have been trying my best to help them with whatever comes their way. My life in the U.S. was not always great. My third daughter was diagnosed with cancer. This was the worst news I could receive. Now she is healthy and everything is going good for her. She shines the family and I hope that one day she will be the first in the family to make a huge difference. I believe that God has helped me get through all my milestones. Thanks to all the people that were their with me and helping me with some of my struggles. Now, my mom has a visa and is able to come visit every six months. This narrative was written by the immigrant’s daughter.